There are encouraging signs that Raith Rovers are beginning to get into their stride under John McGlynn. A season that has been crying out for consistency delivered a third straight victory for the first time following this 2-0 win over Airdrieonians at Stark's Park. It was also the first time the team has kept back to back clean sheets this season, but this match will be most remembered for some of the sparkling football played during an impressive spell in the first half. Picking up where they left off at Hampden the previous week, Raith's mixture of composed build-up and explosive forward play approaching half-time was a joy to behold, and a nightmare for Airdrie to try and deal with. 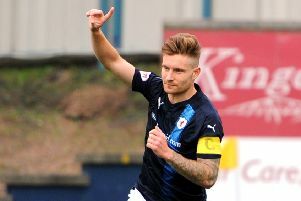 The visitors arrived in Kirkcaldy on the back of their own three-game winning streak, and there was no shortage of confidence in their start to the game as they pushed forward and pinned Raith back. But fresh from signing his contract extension in midweek, Rovers top scorer Kevin Nisbet conjured up a goal out of nothing to give his side a sixth minute lead in their first attack. A throw-in sent him chasing the ball down the left, and a sweet nutmeg on defender Jonathan Page left him with a clear run into the box. From a tight angle the odds were still against him, but he drilled a low shot to the near post which David Hutton could only deflect high into the net. The goal failed to deflate the visitors who remained a threat, particularly from cross balls, in what was a largely uncomfortable opening spell for the Rovers defence. There was a sign of a shift in momentum on the 25-minute mark when the home side conjured up a gilt-edged chance following a flowing move from back to front. Grant Gillespie, who had a storming game at right back, found himself in an advanced position to take advantage of hesitation in the Airdrie defence to go one-on-one with Hutton. The goalkeeper came out on top, turning his effort behind for a corner, but it was all the encouragement Raith needed to grab this game by the scruff of the neck, with the remainder of the first half backing up McGlynn's claim that his team play the best football in the division. A sweeping move on the half hour mark delivered the second goal with Nathan Flanagan's wicked cross from the left spinning off the head of Nisbet towards Liam Buchanan, who had to fight his way past a defender before blasting into the roof of the net from six yards. With confidence brimming, Raith were now playing a brand of football that was more San Siro than San Starko as they zipped the ball across the pitch with pace and precision. Daniel Armstrong had his full back on toast, and a neat one-two with Buchanan put the winger into a great position in the box only to see his goal-bound effort blocked. On 41 minutes, Gillespie was at the heart of another move that ended with Buchanan firing a shot towards goal that forced Hutton to save with his legs. The move of the match, and arguably of the season so far, came two minutes before half-time as both wingers drifted inside to link up brilliantly, releasing Euan Murray down the left, and his cut back was knocked inches wide by Flanagan. It was glorious football and the home fans were lapping it up. They were hoping to see more of the same after the break, but by comparison, the second half was a non-event. Airdrie changed shape and personnel, giving them more control of the game, and Raith seemed content to sit back and hit on the break. Daryl Duffy was inches away from bursting the net with a 30-yard thunderbolt just after the break, while at the other end, Armstrong fired narrowly wide after cutting inside following a short corner. An Airdrie goal would have made life awkward but goalkeeper Robbie Thomson put paid to that with a stunning point-blank save to deny Leighton McIntosh on 58 minutes after a corner to the back post was nodded back across goal. The Diamonds certainly gave it a go in the second half, and despite a few shaky moments at the back, with Kyle Benedictus almost succumbing to cramp, the clean sheet was earned, and the three points were never really in any danger. There is a still a way to go for Raith to get up to the winning standard set by Arbroath, but progress is being made, and the 20-minute spell before half-time shows just how good this team can be.